The mango is considered "The Queen of Tropical Fruit" due to her lush flavor and juiciness. Mangos grow from trees that can reach heights of 30 m (100 ft) and live to be 300 years-old! Like many tropical plants these trees prefer to be in humid environments and are sensitive to low temperatures. It takes the fruit of the mango tree approximately 4-5 months to reach maturity. 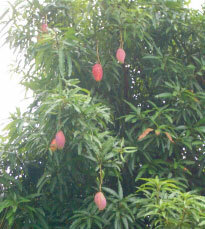 The ripe fruit of the mango tree varies in size and color, but typically they are yellow, orange, red, and green. Mangos can be plucked from the tree and eaten raw. Mangos originated in Southern Asia, but were introduced to the Americas around the 1600s. Initially mangos had to be pickled during the long voyages across the seas due to lack of refrigeration. Due to the pickling method to keep mangos from spoiling the term "mango" became a verb meaning "to pickle". With the introduction of mangos to the Americas they soon became a staple of the Brazilian diet due to the ability to grow abundant fruit and their rich nutrient content. Brazil is now the major mango producing country in South America producing more then 900,000 tons of fruit each year. The United States and Europe are the major importers of Brazilian mangos. Like many fruits, mangos are an excellent source of vitamins, minerals, and dietary fiber. Mangos are rich in vitamins A, C, E, B, and K as well as potassium, copper, iron, phosphorus, magnesium, calcium, sodium, selenium, manganese, and zinc. To make the mango an even stronger superfood it is packed full of antioxidants which have been shown to aid the body in fighting disease. Mangos like many fruits have an amazing richness of nutrients that are great for helping keep your body healthy. During my research on these various foods, I come across fun facts that I never knew. Usually it is the medicinal properties of the plants or the other uses besides food. However, when researching the mango, this is the first fruit I have come across that you can become a fan of on facebook and so far 4,408 people like mangos on facebook (and 1,106 like Jango Mango)! Some other interesting facts about mangos are; it is part of the cashew family, people sensitive to poison-ivy may also have a reaction to mangos, cows used to be fed mango leaves to obtain euxanthic acid from their urine which was then used as a yellow dye, and there are more then 1,000 mango varieties grown around the world! After your next big adventure enjoy the yummy, energy packed mango bars on the next page!